Communications with the resident monastic community can be addressed to sangha@ratanagiri.org.uk. 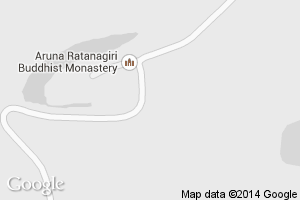 Matters of monastery administration can be addressed to secretary@ratanagiri.org.uk. If you are interested in staying as a guest at the monastery, please write to our guestmaster (guestmaster@ratanagiri.org.uk) including a bit of information about yourself, for example age, gender, background and interests in Buddhism and meditation. For more information see Visiting and Staying. Regrettably we do not have the resources to respond to general questions about Buddhism. Please refer to readily available information at other sources. Note, if you are looking for directions, Harnham is the name of the hamlet in which Aruna Ratanagiri Monastery is situated. through Ponteland and continue to Belsay. turn right following the sign to Harnham. There is no service on Sunday or Bank Holidays. Please note, it’s necessary to request or signal the driver to stop when getting on or off the buses at Harnham. There is a ten minute walk along the farm lane, through two gates, to the Monastery. Peter Hogg bus 131, dep. Ncl (Eldon Sq) 14.00, arr. Harnham 14.33. PCL bus 808, dep. Ncl (St. Thomas Str., SE-bound, opposite Haymarket bus station) 17.20, arr. Harnham 17.55. Peter Hogg bus 131, dep. Ncl (Eldon Sq) 15.00, arr. Harnham 15.33. PCL bus 808, dep. Ncl (St. Thomas Str., SE-bound, opposite Haymarket bus station) 16.55, arr. Harnham 17.30. It is prudent to check ‘Traveline Journey Planner’ for the most up to date information as bus times change. Please let us know if you are aware of any errors on this page.